Shiwasu is a Japanese word for December which literally means "teachers run around." This word reflects the busiest month of the year. How do the Japanese spend the end of the year? During December, bounenkai (forget-the-year-parties) gatherings are held among co-workers or friends in Japan. It's a Japanese custom to send oseibo (end-of-year gifts) around this time of the year. Also, it's customary to write and mail nengajo (Japanese New Year's postcards) in December so that they are delivered on New Year's Day. On the winter solstice, some Japanese traditions are observed, such as eating kabocha and taking a yuzu bath (yuzu-yu). The reason for that is our wish to stay healthy during the winter by keeping warm and eating nutritious food. An important Japanese end-of-year custom is oosoji, which means extensive cleaning. In contrast to spring cleaning that is common in the US, oosoji is traditionally practiced when the weather is rather cold. It's important for the Japanese to welcome a new year with a clean state, and all cleanings are done at home, work, and school before New Year's holiday. When the cleaning is done, New Year's decorations are usually placed by December 30 around and inside houses. A pair of kadomatsu (pine and bamboo decorations) is placed at the front door or at the gate. Shimekazari or shimenawa made with a twisted straw rope, paper decorations, and a tangerine are hung in various locations to bring good luck. It's said that bamboo, pine, tangerines are symbols of longevity, vitality, good fortune, and so on. Another New Year's decoration is kagamimochi which usually consists of two round shaped mochi rice cakes one on top of the other. Since it's traditional for the Japanese to eat rice cake (mochi) during New Year's holidays, mochitsuki (pounding of mochi rice to make mochi) is done at the end of the year. People traditionally use a wooden mallet (kine) to pound steamed mochi rice in the stone or wooden mortar (usu). After the rice becomes sticky, it is cut into small pieces and shaped into rounds. As prepackaged mochi rice cakes are commonly sold at supermarkets nowadays, mochitsuki is not as common as it used to be. Many people use automatic mochi-pounding machines to make mochi at home. In addition, New Year's foods (osechi ryori) are prepared before New Year's holiday. As many people are off work from the last weekend of December to the first weekend of January in Japan, it's one of Japan's busiest travel seasons. After the all busy work, the Japanese usually spend New Year's Eve (oomisoka) rather quietly with the family. It is traditional to eat soba (buckwheat noodles) on New Year's Eve since thin long noodles symbolize longevity. It is called toshikoshi soba (passing the year noodles). Soba restaurants around the country are busy making soba on New Year's Eve. People say to each other "yoi otoshiwo" which means "Have a nice year passing" at the end of the year. 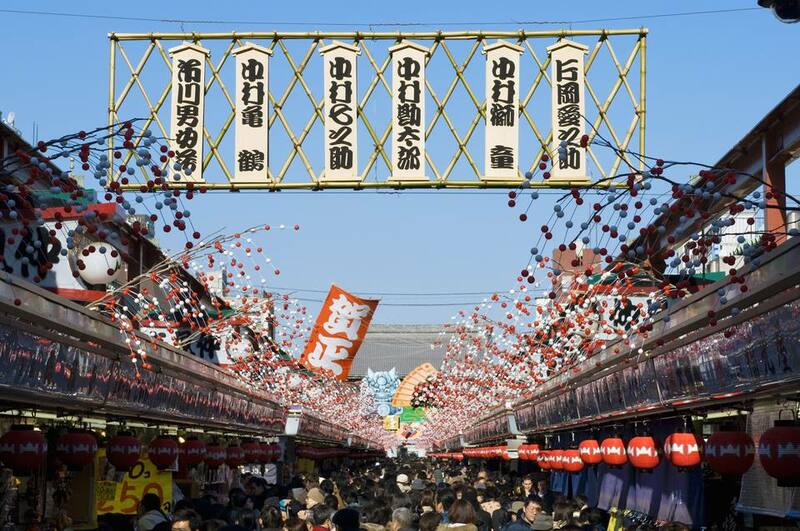 Before midnight on New Year's Eve, temple bells across Japan begin to toll slowly 108 times. It's called joya-no-kane. People welcome the new year by listening to the sound of temple bells. It is said that the temple bell tolls purify ourselves of our 108 worldly desires. At many temples, visitors can strike joya-no-kane. You might need to arrive early to participate in tolling the bells.